Farewell to Tom Rapp, a great psychedelic adventurer and craftsman. A true cult icon died today. Tom Rapp, leader of Pearls Before Swine, the pioneering psychedelic folk outift who recorded for the experimental ESP-Disk' label. Debut One Nation Underground was released in 1967, including mesmerizing songs like I Shall Not Care, it became an unexpected success, selling more than 250.00 copies. But it is follow-up album Balaklava which widely is regarded as the band's finest work. Lovely melodies on Images Of April and Translucent Carriages, enhanced by mystic lyrics, and wrapped in a nightmarish record sleeve of Breughel's 'The Triumph of Death'. 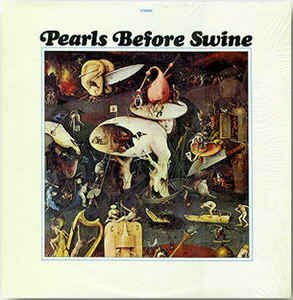 Normalizing their sound somewhat, Pearls Before Swine continued into the early 1970s, basically as a vehicle for Rapp's songs, until he ditched the PBS name and started releasing records under his own name.